I hate being proactive. Because I do it so rarely, I’m just not very good at it. Planning ahead for once, I decided to have blank pages added to my passport before I left for Central America. Now I’m stuck in limbo, hoping I’ll get it back. Eighteen months ago, I left home with a shiny new 24-page passport and though I’ve only visited a total of 7 countries, it now only has 2 blank pages left. I did a lot of border hopping in SE Asia to extend my stay in one country or the other and each crossing required a visa that filled up an entire page. Obviously, I’ll need more so I thought it’d be smart to add pages here in Austin rather than deal with it in, say, Guatemala. Adding pages normally takes 4-6 weeks (expedited service is 2-3 weeks) and since I’m making a quick trip to Korea for my brother’s wedding in two weeks, this obviously wouldn’t work — I’d have to use a passport service. The Man wants $142 for this service (which was free just a year ago) and the passport service charges $110 for a 5-10 day turnaround. I hated spending the extra money but really didn’t have an option so I trudged down to their office with my passport, printed itinerary and checkbook in hand. “Honestly, a year of traveling in Asia during the summer is what happened.” I carry it in a money belt holster-style under my left arm and well… Asia gets hot. There have been times when I could literally wring sweat out of the pouch. The answer to that, apparently, depends entirely on which nameless clerk processes the passport and what his/her mood is like at that moment. If they’re feeling picky, they can declare the passport to be “mutilated” and refuse to add the pages. And the best part? They keep it. I’ll have to start from scratch and get a new passport if it doesn’t pass muster. Getting a new passport would require a birth certificate and a valid driver’s license. Mine, of course, expired while I was out of the country so I’d have to take the driver’s test again like an eager 16-year-old. And to take the test, they’ll want to see the registration and insurance for my motorbike which is sitting storage with neither. It will get very expensive very quickly. So the 10-day express option was dead — if they rejected it, I would only have a day or two left before leaving for Korea which is not enough time to start over. The 5-day super-express option was now necessary, adding another 100 bucks to the cost. I typed up a nice letter explaining to the passport clerk that I traveled full-time, carried it with me at all times and that I would take much better care of it in the future, I promise. After signing a few forms and handing them $350, I walked out the door completely at the mercy of someone I’ll never meet and praying to God that they get laid this weekend. I got the call Monday that my passport was ready to go. I now have 48 extra pages just waiting to be stamped, stapled and abused. I hope you get your passport back in time, and make it to middle & South America. I can advice you to go to Tical in Guatamala, where I visited 10 years ago. I heard it much more touristic now days, but still not as bad as Chichen Itza in Mexico. Also, crossing the Panama canal, you can simply go to the yacht club, and offer to help as a line handler on one of the private yachts waiting to pass through. This will get you to Colon, a city you need to avoid, so go straight from the yacht club to the bus station and take a bus back to Panama City. Furthermore, I can highly recommend the island group Bocas del Torro at the Caribbean side in the North of Panama. Thanks for all the tips! Cheers. Damn… that is a rough situation. If it makes you feel any better Guatemala, Honduras, Nicaragua, and El Salvador only require one stamp going in and one going out assuming you don’t stay for over there months. They form some sort of union that allows each others stamps from what I recall. Wow that’s some serious bucks just to get your passport current, making my little border run every 14 days look a lot more fun :-) You cant get same day service in the US for a new passport even if it means hopping on over to Washington or some other place? we can get a new 64 pages in 4hrs in the UK. Could you just get the Texas ID card from the DPS instead of the drivers license? That might cut down a small bit of the hassle. Ooh, that’s a damned fine idea and well worth looking into. Thanks! Oh man, what were you thinkin’? I’ve never had a hassle getting extra pages overseas. I’ve done it 3x there and once back home in Chicago where I also had same or next day service directly at the fed office. Mine’s been through the washing machine. Only time someone griped was a Brit at Gatwick, but she let me pass anyway. It rarely reads at immigration and they just type it in. When are you going to be in Korea??? I arrive in Seoul next Wednesday, stay for a week. Methinks we miss each other there unless you wrote this a week ago. Bummer! Oh man, we’re close but not quite. I fly out the 21st. Whirlwind trip anyway – bachelor party, horrible jet lag, wedding, fly home, more jet lag…. I’m with Kevin here – getting extra pages at US embassy overseas is definitely the way to go. Dan and I both managed to get 3 sets of extra pages in our passports thanks to Bangkok & Berlin embassies…and it took 30 minutes. But, the consul in Berlin did inspect my passport before giving the thumbs up. 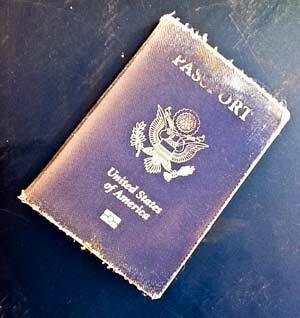 Do you have your passport in a plastic cover? Not only practical, but if your cover is from another country it can be kind of fun to confuse people (ours are from Turkmenistan/Czech Republic). Good luck – I definitely feel your pain here! I didn’t realize how much border hopping was required for trips until recently. I’m hoping we won’t have to get new pages while abroad. I think I would cry if they didn’t give it back. So much history and memories. This is kind of old/bogus info. I thought I’d have to provide this documentation to the US embassy in Bogota after my passport was stolen, but they said it wasn’t necessary (they could just look me up in the computer!). If they could do it for me, I’m sure they could do it for anyone. But it wouldn’t surprise me if people in the US still need to go through the extra hoops, even if they’re my age or older and had multiple passports by now. Yeah, it’s different here in the states where they’re processing thousands of them. You don’t quite get that one-on-one service here. That puts my passport woes to shame. 10 days before we were due to leave the UK (after a 2 month visit) I realised I probably didn’t have enough pages left for our upcoming trip to Asia, and it expired in 18 months and I didn’t know when we’d be back. I’m usually really organised so I don’t know how I had ignored this fact for so long. In England we can’t get pages added so I had to pay loads for the one day in person new passport service. Luckily we were only 45 minutes away from the office. It was all very efficient in the end. Good luck getting yours back. Wow that is insane. I could understand them thinking it’s mutilated, but for them to not give it back is just wrong. They should at least give it back while you process a new passport & not process one at all. Try to get back at least and then wing it go to an embassy in Central America and get pages there. It may be easier. I hope everything works out & you get it back on Tuesday. My fingers are crossed. Handing over a passport is the most terrifying experience on earth, I believe. When I sent mine off to the Thai embassy in Scotland I didn’t breathe for three days till it was back in my hands! In that case I wish I had gotten the visa in the US… it cost more in the UK! Did you try ABC Passport Express on Rio Grande? Just a thought in case you hadn’t talked w/them yet. Yeah, that’s who I’m using, actually. Nice guys and very helpful. Lol, that is very unpleasant situation. You have to wait some time but I hope everything will be ok on Tuesday, let us know what happened. After all who cares how your passport looks like – it is full of great memories, isnt it? It all worked out, thankfully. Now my passport is fat and burly-looking — just like me. In case you have to add more, it might be useful for you to know that it costs only $82 (I say “only” because you mentioned a whopping $142) and they don’t give two hoots how your passport looks if you add pages at a U.S. consulate overseas. I just got three extra sets added to my passport here in Brasília – and my passport looks similar to yours. Well, that was a particularly worthwhile couple of mins I invested reading your blog, regards.